Americans seem to love debt. So much so that the typical American incurs debt at almost every stage of life, from the teenage years to the final years. As shocking as it may sound, the average American spends a lifetime in debt. Take a look at the full graphic now, or continue to read! 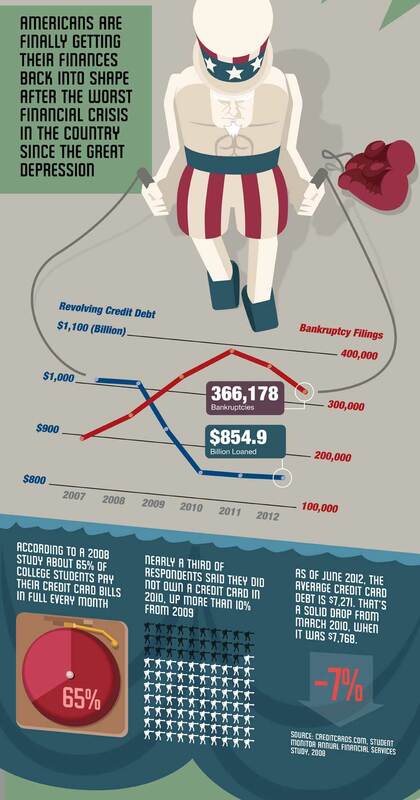 Then first debt that many teenagers get into is credit card debt, particularly with store credit cards. Although the Credit Card Accountability and Responsibility Disclosure (CARD) Act of 2009 restricts lenders from issuing credit cards to people under 18, many young people manage to acquire credit cards anyway, often at the encouragement of their parent or parents. And the popular choice? Department store cards. However, these cards can carry higher interest rates than most, especially for young people with little to no credit history. The average person spends more and more on debt every year. This begins with the first department store card and continues with the first credit card. Many people consider their first credit card to be a step toward adulthood and responsibility. In fact, more than 70 percent of college students have credit cards, and less than 2 percent of undergraduates have no credit history. Yet studies indicate that students know little about their obligations and how these cards work. This can be seen in the debt levels they carry. The average undergrad has $3,200 in credit card debt, indicating that they have yet to understand what they have gotten into. Of course, student debt doesn’t end there. In addition to credit card debt, many students have student loan debt for their undergraduate degree, with an estimated 12 million students included. According to recent figures, the average debt is almost $27,000 for a four year degree. This number is even higher for graduate students, with master’s degree students taking on an additional $17,000 in student loans and doctoral students $29,000. However, medical school graduates leave school with an average of $113,000 in debt, in addition to the 4 or more credit cards and average $8,600 owed on them. And yet many of these students have little idea how their credit will impact their future. And that’s just the beginning! Auto loans average $30,738 worth of debt and continue to increase as the loan length increases. The average mortgage is now $230,000 and continues to increase, despite low interest rates. Then come the add-ons, like a second car loan, more credit cards and mortgage refinance or home equity loan. Sometimes these loans are taken just to buy the latest gifts or to have more and more stuff in the house. At other times, additional loans are taken to pay off earlier loans! Home equity might be used later in life to get rid of lingering student loan debt. Homes might be refinanced to purchase an additional car or truck! The cycle just goes on and on. Last but not least are funeral expenses. The average funeral is well over $10,000 and while other options are less expensive, many families take on the debt anyway. Maybe it’s time to put those credit cards away after all? The average family has $3,800 in the bank. No one in the family has a retirement account (in 50 percent of American households). Their neighbors (the other 50 percent) only have $35,000 saved for retirement. The family has no mutual funds, stocks or bonds. The house is worth $160,000, but the family owes $95,000 on it to the bank. They make $43,000 a year, but can't manage to pay off a $2,200 credit card balance. 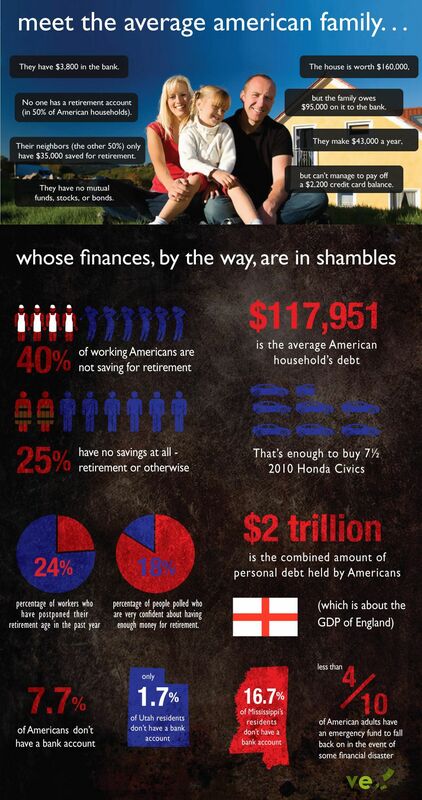 The average American familys finances, by the way, are in shambles. Forty percent of working Americans are not saving for retirement. Twenty-five percent have no savings at allretirement or otherwise. The average household has $117,951 in debt. Thats enough to buy 7.5 2010 Honda Civics. The combined amount of personal debt held by Americans is $2 trillion. This is about the GDP of England. Twenty-four percent of workers have postponed their retirement age in the past year. Eighteen percent of people polled are very confident about having enough money for retirement. Among Americans, 7.7 percent dont have a bank account. Only 1.7 percent of Utah residents dont have a bank account, while 16.7 percent of Mississippis residents dont have a bank account. Less than 4/10 of American adults have an emergency fund to fall back on in the event of some financial disaster. Are Americans winning the financial struggle? The economic battle continues to drag on. Americans were knocked down, but not out after the housing bubble burst in 2008 and the Great Recession lumbered ahead. Getting back to their feet has been a struggle, but slowly their finances are getting back in shape. Now they are smacking down their debt, while trimming bankruptcies and foreclosures. 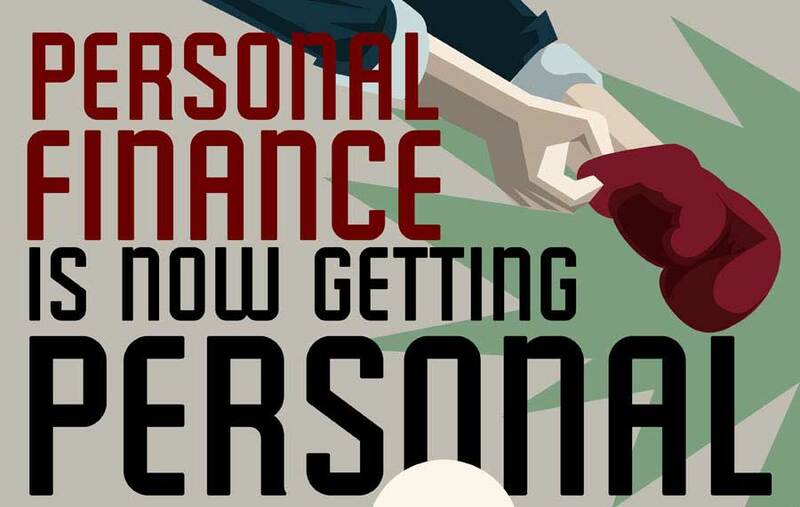 Americans everywhere are gaining strength in their personal finances while pumping up personal income. While the amount of personal debt being carried by American’s is declining, in many regions throughout the country, bankruptcies are up. People may be spending less on credit cards simply because they have no credit available to them. Therefore some of these same people are driven into bankruptcy because they have no other options. From college students paying their credit card bills on time, to a drastic drop in credit card interest rates, it certainly appears that things are changing. All across the country, people are making an effort to spend less, reduce debt and save for the inevitable rainy day. American’s debt is largely made up of the home. Mortgage debt represents almost $9 of every $11.38 spend on debt. It is no wonder that foreclosures continue to rise while other debts fall. Yet as unpleasant as they are, a foreclosure may be exactly what is needed in order to start over financially. A key reason that foreclosures are up revolve around the fact that incomes are up as well. That means while foreclosures are not pleasant, the end result is the debtor being in a better financial position to rebuild his or her debt. While the increase in income is good news, the relatively slow increase in inflation is even better news. 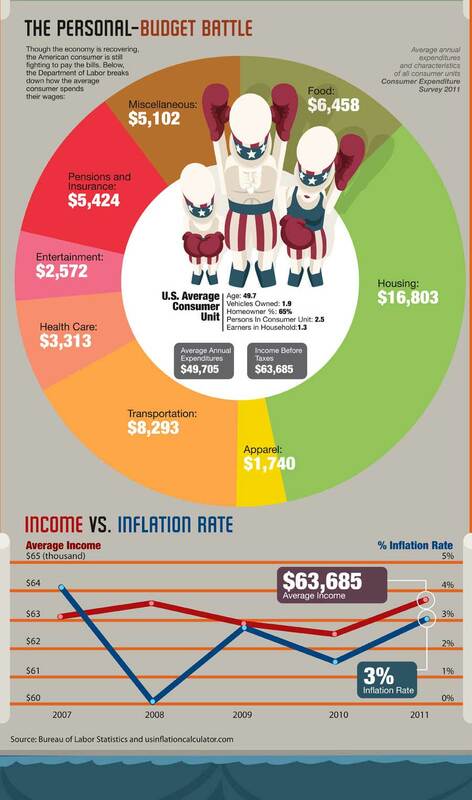 Income currently outpaces inflation, leading to a greater net purchasing power for American workers. How will America’s financial struggle end? That will remain a mystery. However, there are a lot of tools the can help you budget and plan as you fight the financial fight of your life.